Latest price of Realme U1 64 GB in India was fetched online from Flipkart, Amazon, Snapdeal, Shopclues and Tata Cliq. 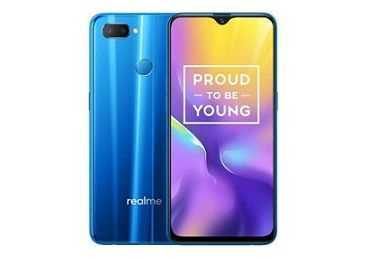 "Realme U1 3GB RAM and 64GB Storage Announced in India at Rs. 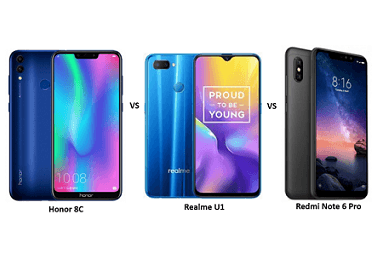 10,999" Realme has announced a new memory variant of its popular Realme U1 smartphone. 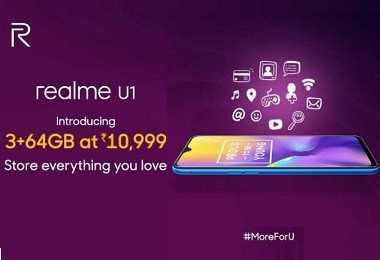 "Realme U1 Got Cheaper in India: Receives Price Cut of Rs. 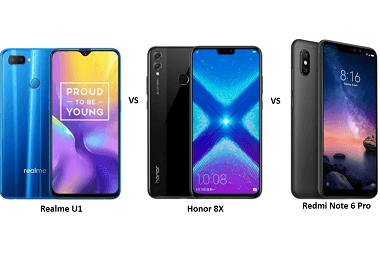 1000"
"Asus Zenfone Max Pro M2 vs Realme U1: Battle of Budget Smartphones"
"Honor 8C vs Realme U1 vs Redmi Note 6 Pro: Battle of sub-15k Smartphones"
"Realme U1 vs Honor 8X vs Xiaomi Redmi Note 6 Pro: Price, Features and Specifications Compared"
Following in the footprints of Realme 2, the Chinese smartphone brand has recently launched Realme U1. While the design of the phone is heavily inspired by the recent launches and features a circular fingerprint scanner and horizontal dual camera setup, there are some other considerable changes on the inside and outside. For instance, Realme U1 is the first smartphone to be powered by the advanced MediaTek Helio P70 chipset. Moreover, its selfie camera is positioned inside the waterdrop notch to add a touch of class to its thin bezel-less frame. The selfie-centric phone runs on the latest Android Oreo 8.1 out of the box and has innovative AI capabilities that are currently trending among other high-end devices. 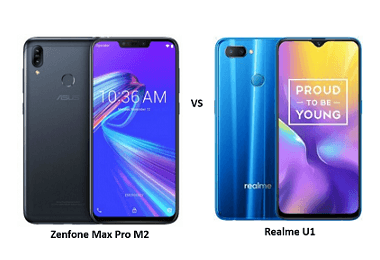 Realme U1 price is in line with most of the popular mid-range phones. As a phone is designed to cater to the rising popularity of selfie enthusiasts in the country, Realme U1 features a 25MP front camera. The powerful camera uses a 6-element lens to offer improved clarity and sharpness throughout the day and night. On the back, the phone has a 16MP+8MP dual camera setup with autofocus to help users take wide-angle pictures with ease. Realme U1 comes with internal storage of 64GB with memory card support of up to 256GB. It has a 4GB RAM for smooth multitasking. Realme U1 features a 4,000mAh Li-Ion battery. Based on the battery life of the previous releases like Realme 2 and Realme 2 Pro, Realme U1 is also expected to have impressive battery life. Even after all the selfies, games, videos, and social networking, the phone should easily last an entire day on full charge. The phone has a 6.3-inches IPS LCD display with a resolution of 2340 x 1080px and a pixel density of ~409ppi which is in line with some of the latest releases from other brands. Realme U1 is a dual-sim phone with support for 4G VoLTE in both the slots. Other connectivity options include Bluetooth v4.2 with A2DP, Wi-Fi, GPS, NFC, microUSB v2.0 and USB OTG. The phone runs on Android Oreo 8.1 with ColorOS 5.2 skin on top. The new OS skin brings in a host of new features like real-time translation, AI engine, navigation gestures, fast Face Unlock, and split-screen multitasking to Realme U1.